As is the case every year, MWC 2019 was again the platform where top smartphone brands showcased the very best of what they had to offer. Sony has had a rough ride these past few years, but perhaps the refreshed Xperia 1 could help the brand make its mark yet again. Nokia has also made great strides especially in the camera department with its Nokia 9 PureView. Samsung, on the other hand, held its official S10 series unveiling a few days before MWC. This is where we got our first look at the Galaxy S10e. Let’s take a look at how these three phones stack up when pitted against each other. The Nokia 9 PureView comes with a starting price of USD 699 which roughly equates to INR 50,000. The Galaxy S10e starts off at USD 749 which roughly amounts to INR 53,000. 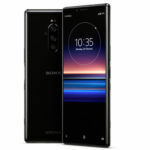 The Sony Xperia 1 is the most expensive phone in this comparison as it is said to be priced at £849 (about INR 80,000). All three phones in today’s comparison possess flagship-grade build and design. All of them come with glass-clad front and rear panels that sandwich a metallic frame. They also get Gorilla Glass 5 and 6 protection, along with IP67 or IP68 rating for water and dust resistance. 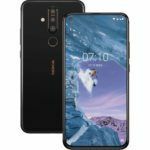 The Nokia 9 PureView is the only phone here to offer an in-display fingerprint sensor. The Xperia 1 opts for a side mounted sensor, while the S10e makes use of one embedded within its power button on its side. 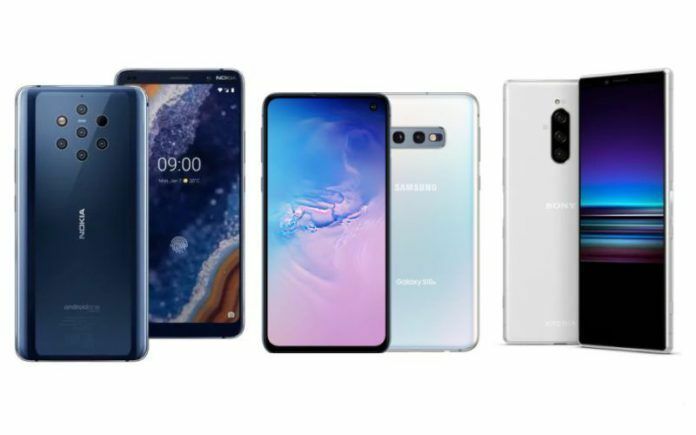 While none of these phones sport a conventional notch design, a punch-hole camera cutout can be found on the S10e’s display. The Nokia 9 PureView comes with a 5.99-inch P-OLED screen with a QHD+ resolution and an 18:9 aspect ratio. 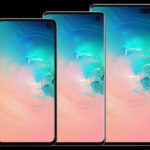 The Galaxy S10e takes it a step further by offering the same resolution on its 5.8-inch Dynamic AMOLED, but with a 19:9 aspect ratio and a noticeably higher screen to body ratio. The Xperia 1 is in a league of its own with its 21:9 CinemaWide 4K OLED screen. The Sony smartphone comes powered by a Snapdragon 855 chipset. Indian variants of the S10e will ship with an equally powerful Exynos 9820 SoCs. Sadly, HMD Global took its time getting the Nokia 9 PureView ready for the market, causing the phone to end up with a Snapdragon 845 chipset. It is difficult to pick out a clear leader among these three with regards to their imaging prowess as each has its own unique implementation. The Nokia 9 PureView comes with five 12MP rear cameras, two of which are RGB sensors while the other 3 are monochrome. There is a so a TOF camera accompanying this setup. A 20MP sensors at the front handle selfies. None of these sensors offer OIS. The Xperia 1, meanwhile, makes use of three 12MP rear sensors. One of these is a standard sensor, the other offers 2X zoom capabilities, and the third allows ultrawide angle imaging. The first two sensors are capable of 5-axis OIS. Selfies on this handset are handled by an 8MP camera. Then we have the Galaxy S10e with dual rear camera setup comprised of a 12MP primary shooter with OIS and a 16MP ultra-wide sensor. The front of the phone houses a 10MP sensor. This is the first phone to offer dual-pixel autofocus on the front camera. All three phones here charge over USB Type-C with fast charge support and are capable of wireless charging. The S10e comes with a 3100mAh cell, the 9 PureView gets a 3320mAh battery, and the Xperia 1 boasts a 3330mAh battery. The most notable difference here is with the S10e that can also reverse wireless charge other supported devices. 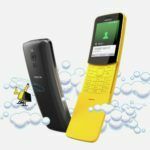 With what we can see above, all three smartphones offer widely different set of specialized functionalities. If you desire a balanced handset with all-round flagship performance that doesn’t go overboard with its pricing, then the Galaxy S10e is the one for you. If you are feeling a bit adventurous with regards to imaging capabilities, then the Nokia 9 PureView might tickle your fancy. For movie buffs looking for the ultimate handheld viewing experience, the Sony Xperia 1 is the phone to look out for.